Almond Moon is our take on a traditional Bakewell tart; using our signature polenta and ground almond shortbread base. Instead of raspberry jam we use cranberry sauce. 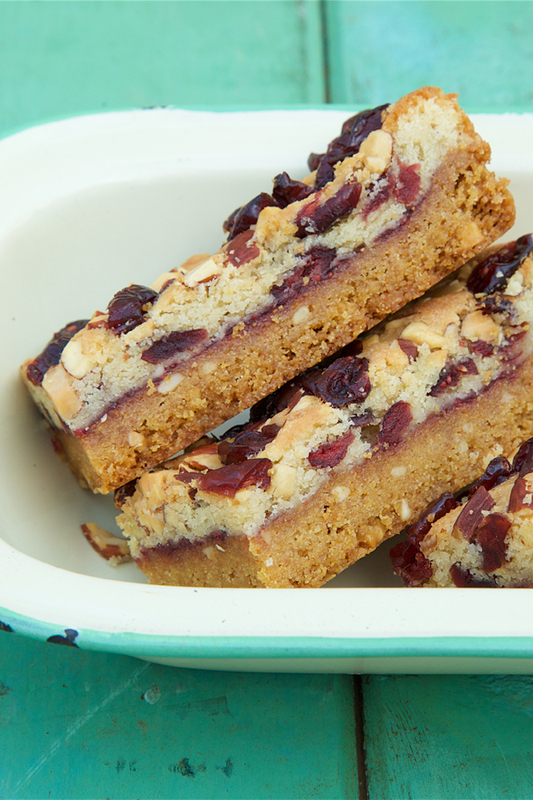 The handmade frangipane topping is studded with cranberries and toasted almonds. Not a blob of white icing nor a glace cherry in sight! Almond Moon has won Best Speciality from the South West and a Gold at the Great Taste Awards. As a pudding, beautiful warmed through and served with almond milk custard. Suitable for vegetarians. Allergen information can be found here. Part of our Classic Range of well established favourites. "Just wanted to say how much I LOVE the Almond Moon bars. I am sooo addicted to them. Thank you from a very grateful coeliac," H. M.
"Delicious taste and texture. It's hard to believe these treats are gluten free. Finally no jealousy when my sister has a sweet treat," D.L. "Just had my first ever taste of Honeybuns Almond Moon - OMG, order on its way," F.F. "Enjoying an almond Moon with my coffee, delish!," C.S. "My wife recently had one of you Almond Moon cakes in a cafe in Eastbourne...It was suitable for her being a vegetarian and she said that it was about the best bought cake she had ever had," C.P.